"A precious synthesis material used in melding. It raises the resulting command to the maximum level and attaches an ability." 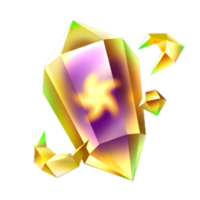 Secret Gem is a material available in Kingdom Hearts Birth by Sleep, and Kingdom Hearts Birth by Sleep Final Mix. It can be used during Command Meld to attach a random ability to the synthesized command, and immediately raise it to its maximum level. Secret Gem is represented by four jewels with a unique structure. The main jewel is the largest, is tube-shaped, and has facet cuts. Two medium-sized jewels are hook-shaped and revolve around the main jewel. The smallest jewel floats between the two hook-shaped ones. All four jewels are golden yellow with green tints at the edges, and the largest one has a swirling, purple and yellow, smoky design in its center. An ore is a type of rock that contains important minerals, such as metals. "Secret" may reference the fact that the material can only be obtained through rare drops from the Flood and Vanitas Remnant, the weakest and strongest Unversed, respectively, or excelling in certain mini-games. Secret Gem: Collect 100 points in Terra's Sticker Album; collect 100 points in Aqua's Sticker Album. Secret Gem: Collect 100 points in Terra's Sticker Album; collect 100 points in Aqua's Sticker Album; chest at the Upper Zone. Secret Gem: Purchase from Medal Shop for 1500 medals. ↑ The Secret Gem is available at Arena level 10. ↑ Cost 2700 in the original Japanese version. ↑ The Flood drops a Secret Gem 1% of the time if the hero has a shop level of 7 or 8. ↑ Vanitas Remnant drops the Secret Gem in the Japanese version only.